The “Response Profile” table in Output 58.3.1 shows that the strong dislike (y=1) end of the rating scale is associated with lower Ordered Values in the “Response Profile” table; hence the probability of disliking the additives is modeled. The odds ratio results in Output 58.3.2 show the preferences more clearly. For example, the “Additive 1 vs 4” odds ratio says that the first additive has 5.017 times the odds of receiving a lower score than the fourth additive; that is, the first additive is 5.017 times more likely than the fourth additive to receive a lower score. 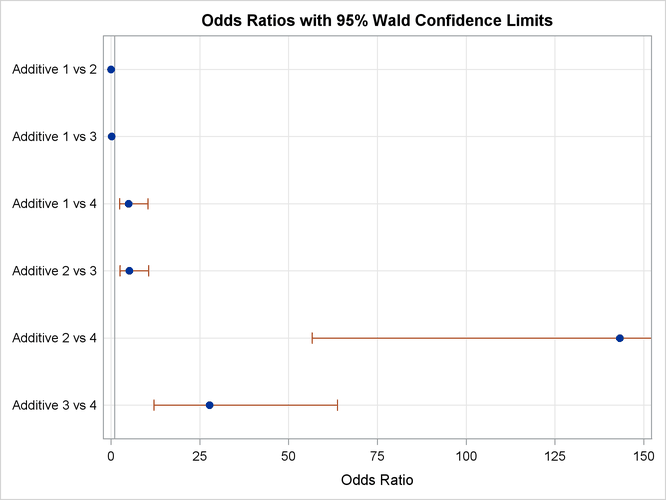 Output 58.3.3 displays the odds ratios graphically; the range of the confidence limits is truncated by the RANGE=CLIP option, so you can see that “1” is not contained in any of the intervals. The estimated covariance matrix of the parameters is displayed in Output 58.3.4. 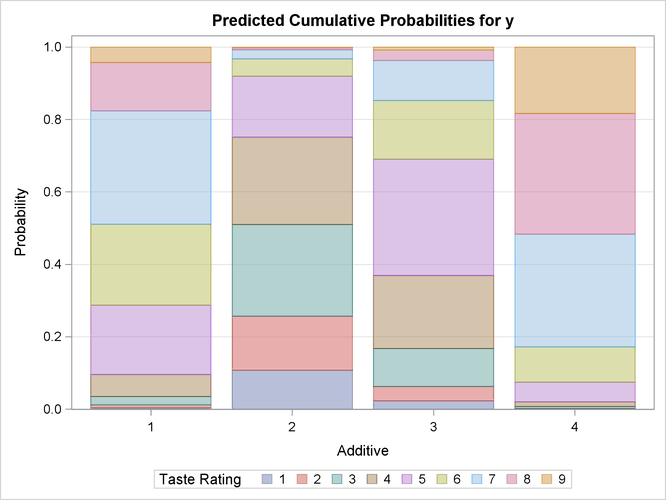 Output 58.3.5 displays the probability of each taste rating y within each additive. You can see that Additive=1 mostly receives ratings of 5 to 7, Additive=2 mostly receives ratings of 2 to 5, Additive=3 mostly receives ratings of 4 to 6, and Additive=4 mostly receives ratings of 7 to 9, which also confirms the previously discussed preference orderings.